For me this was the very first Mahashivaratri in South Africa. The nostalgic past impressions of Belur Math mahashivaratri festival were humming in my mind. 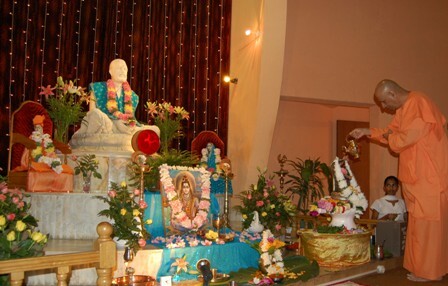 The holy occasion was celebrated on the night of 6 March, 2008 at the Main as well as at all the Sub-centres in South Africa with due solemnity. Nearly 400 devotees participated at the Main centre in Glen Anil, Avoca from 6 pm to next 6 am. Programme included puja to Lord Shiva at every prahar (3 hour per session) thus 4 pujas, bhajan–kirtan singing, discourse, arati by a couple devotee, hawan etc. 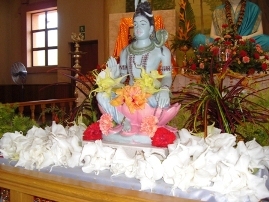 A Shiva image was arranged in front of the Holy Trio at the altar. Outside the altar there was a stone shivalinga. 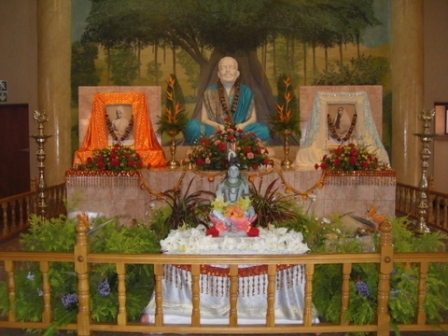 The entire altar was tastefully decorated with flowers by our women devotee-volunteers. I was pleased to see a huge collection of datura flowers that are said to be the favourite of Lord Shiva. In the first session after the opening bhajans I was invited to address the gathering. In my Talks, I traced a little of the legend of Shivaratri celebration and how the whole episode could be interpreted in terms that are understandable for a spiritual aspirant. In the second session Saradananda spoke about the symbolism of Shiva and how the worship of Shiva could be brought out in serving the suffering humanity. The rest two sessions by learned devotees – Smt Veena Daya and Sri Pravesh Ramlal highlighted various aspects on Shiva and Swami Vivekananda. Before the fourth session ended there was a hawan also. Fasting and night vigil were scrupulously followed. On this occasion I visited Chatsworth Sub-centre which had organised night-long puja and other items of programme. I could see a charming dance recital by a student to the cassette-played song of ‘ambalatharase….‘ In the second session my talks centred on the mythological stories on the glory of Holy ashes. Asherville Sarada Devi Ashram in the third session was my next stop and there I addressed the gathering on greatness of Shiva devotees. I was taken in his car by Pravesh, an Exco member and a long-time devotee of the Centre to visit these centres. On my way back first we halted at the one of the oldest Temple in the town called Umgeni Hindu temple founded in 1883. The entire pilgrims had just come out and we had darshan of shivalinga unhindered. Shiva’s grace! Shiva there was having jala abhisheka (water bath). From there we went to another temple called Sri Ranganadar Temple where we saw a good number of devotees listening to the traditional South Indian karnataka vocal music with the accompanying mridungam. Lord Sriman Narayana who is the presiding deity of this temple was found decorated with beautiful patterns of flower garlands. We returned to Avoca just before the beginning of the fourth session. The hawan was completed by Saradananda to the delight of all assembled devotees. After every session of course devotees were provided with glasses of milkshake. Mahashivaratri was indeed a soul-satisfying experience. 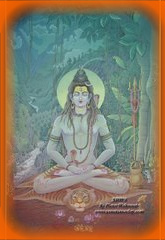 The sacred mantra Om Namah Shivaaya would continue to reverberate in the air for more time to come. Next Post: Why Sun, why Swan and why on earth a Snake? The Chatsworth Sub-Centre really enjoyed Maharaj’s presence and eagerly await Maharaj’s next visit. By looking at the beautiful pictures of Lord Shiva, Shivalinga and the Holy Trio, one can only imagine the heavenly atmosphere that prevailed in the respective shrines. It is heartening to note that Revered Swamijee Graced the different ashrams. All devotees were really blessed to have been in the divine presence of Swami Vimokshanandaji Maharaj. South Africans are blessed to have Swamiji Maharaj in our midst and I am delighted that the typical South African way of commemorating Shivarathri met with Swamiji’s approval! Shivaratri was indeed a night of divine bliss. Swamijis presence and message brought great joy and blessings to many. Keeping the night long vigil amidst the powerful lord still reverberates an echoe of peace and strength. 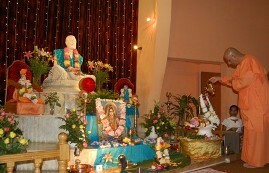 May Swamiji enjoy many more days and nights with all the devotees.